After a walk around Baltimore’s inner harbor on a mild spring evening, I sat down to dinner with a new friend. 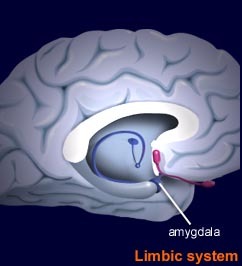 The waiter came over wanting to serve-up steak and lobster but we were already mentally feasting on amygdala or at least a range of topics that relate to this small almond-shaped part of the brain that has so much bearing on three particular types of human suffering: Post Traumatic Stress Disorder, Panic Attacks and Phobias. True, the conversational fare was not typical but nor was the man I was dining with. My new friend Ron had entered college at sixteen and by the time he was 24 years old had finished his Ph.D. in biochemistry and had been hired to teach at Harvard University. Somehow it didn’t surprise me that he grew bored with being a professor at the most prestigious institution of higher education in the United States and then ventured on to medical school. These days, between his busy Manhattan medical practice and writing such books as “The Craving Brain,” Ronald Ruden, M.D., Ph.D. still has time to have some fun. Recently his fun has involved down-loading several hundred professional articles from the Harvard database, spending a couple of years researching them and then developing the most salient explanation of the psycho-neurobiological mechanisms underlying the newest and most exciting innovations to emerge in the field of psychology and complimentary alternative medicine. Of course right in the middle of this remarkable conversation, the waiter had to show us some of the restaurant’s different cuts of steak and a live lobster sitting on a silver platter. The lobster would occasionally move a leg or rotate his eyes toward us like he was trying to figure out what was going on. At that moment I was glad that I had spent the last year studying such topics as quantitative EEG Neurofeedback and other areas related to brain science. It made me confident that I was grasping a good deal more of what we were discussing than the lobster did or even some number of the people at the conference. Eventually the waiter brought our food but the topic of conversation was far more delicious than even the perfectly cooked USDA prime steak. As we talked, I was gaining a clearer picture of the particular synthesis of modern western psychology and ancient Chinese acupressure that comprised the therapy method that I had developed. In particular, I better understood some of the science behind why it worked so well. For some people, the reason why something works is not as important as the readily demonstrable fact that it does work. Yet for others, any novel new treatment approach that has yet to have a large body of research behind it requires at least some plausible theoretical model that will make sense to them. This was something I had been longing for because I often treat researchers, physicians and other hard science types and have presented lectures at hospitals and have trained some of the staff at Ohio State University Medical School in my work. What I needed was a way to explain my treatment method to those who were steeped in traditional science. Dr. Ruden and I were both scheduled to speak at the same international conference sponsored by the Association of Comprehensive Energy Psychology (ACEP) within the following two days. As Dr. Ruden was outlining some of the key points in his talk, he was also illuminating the reasons from a western scientific perspective as to why the psychotherapy method that I had developed, the REMAP process, worked so well. The following link is to the paper that Dr. Ruden has written that so impressed me. I know that Ron reviewed a vast number of papers from the Harvard database in order to cull-down to over 250 papers that he eventually distilled into his article. This took a great deal of his time and it wasn’t cheep either. The Harvard database will let its members review abstracts without cost but there is a $20.00 fee to download a study. Five thousand dollars worth of papers and much time has resulted in his fine article. From my perspective, it was well worth it. If you can keep up with the science (no small task) then I think that you will agree.